The best acoustic guitars for children in 2019 reviewed and rated! It’s easy to get young people started with playing the guitar by finding the best acoustic guitar for kids. To help you choose which one would be perfect for your little one, we’ve scoured the shops for models that meet our criteria. The size should of course be kid-friendly and comfortable. The action should be low for tender fingers and the sound should be exceptional for proper ear training and a more fun learning experience. Lastly, the overall look should be something that would make young guitar students motivated to practice every day. Here’s our shortlist of the best kids’ guitars. Taylor GS Mini Acoustic Guitar From its name alone, you can already tell that the Taylor GS Mini would be a great fit for kids learning to play guitar. It may be small, but the GS Mini has a voice that would make you think it’s a bigger-bodied acoustic guitar. The scaled-down Grand Symphony body makes it easier to play. Really great for kids! Taylor Big Baby Acoustic Guitar We couldn’t resist adding the the Taylor Big Baby in this list of best acoustic guitar for kids. 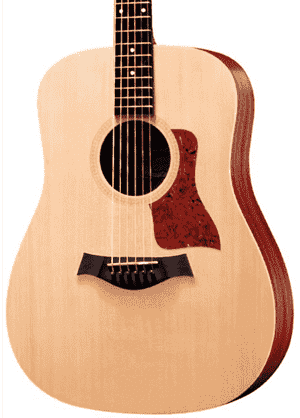 Its size puts its between the Baby Taylor and a full-sized dreadnought, making it a great option for growing kids. It’s not too small and not too big either. You will be impressed by the full-bodied tone that this guitar produces. Martin LX1 Acoustic Guitar The Martin LX1 Little Martin is another great acoustic guitar for kids. Martin’s smallest guitar, the LX1 has a good feel to it that young guitar players will surely appreciate. It’s got the rich sound that Martin guitars re known for and it’s extremely fun to play. Highly recommended for kids and those who want a compact acoustic guitar. 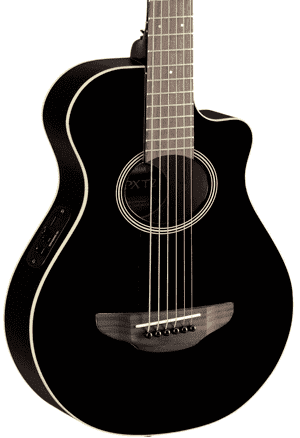 Yamaha APXT2 Acoustic Guitar The Yamaha APXT2 is a 3/4 size version of the APX500II, one of Yamaha’s top-selling acoustic-electric guitars. Aside from having a smaller scale, the APXT2 also has a thinline body, making it easier and more comfortable for children to play. This model comes with a pickup system and built-in tuner, and that’s a plus! Epiphone Pro-1 Acoustic Guitar Specially designed for beginners, the Epiphone Pro-1 Plus acoustic guitar boasts a coated fingerboard with jumbo frets for increased playability. Fretting notes and chords are effortless, especially with the shorter scale length and less tension on the strings. Epiphone also offers free eMedia Online Lessons and a handy Beginner’s Guide with the purchase of this guitar. How awesome is that? Martin LXM Acoustic Guitar The Martin LXM Little Martin is similar to the LX1 except for a few differences. The main difference is that the LXM has a high-pressure laminate top instead of the solid wood top on the LX1. Because of the different material, the LXM has a lower price point than the LX1, but the sound and playability are just as good. Martin Dreadnought Junior Acoustic Guitar Another small-bodied guitar that would be great for kids is the Martin Dreadnought Junior. This acoustic guitar features a solid top. It produces a full-sized sound with a powerful, woody tone that can easily rival that of many of the more expensive acoustic guitars in the market. The scaled-down size and comfortable neck profile make it a joy to play. The Taylor GS Mini has a Grand Symphony body but on a smaller scale. Considered a modern-day parlor guitar, the GS Mini is a great choice for children just starting out on their musical journey because of its small size. But small as it may be, the GS Mini nonetheless has a rich, smooth tone with a volume like that of a full-size guitar. The Taylor GS Mini has a 23.5-inch scale length, which means the frets are placed closer together and translates to an easier time forming chords, especially for small hands. The particular GS Mini variant we recommend is the one with the solid mahogany top, which has a much richer sound than the one with the Sitka spruce top. The GS Mini Mahogany has layered sapele back and sides, which make the guitar more resilient to changes in humidity and temperature, making this guitar a great choice for travel as well. Kids can take this guitar with them to lessons without parents worrying about the guitar suffering from climate damage in transit. The GS Mini also has a sapele neck topped with a genuine African ebony fingerboard and bridge, and is given a nice matte finish. 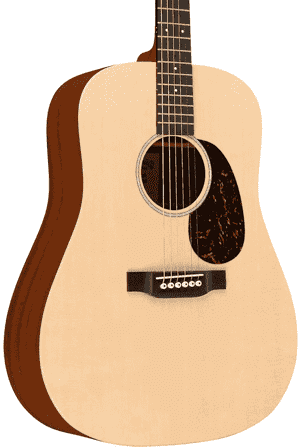 The Taylor Big Baby acoustic guitar is a 15/16 size dreadnought with a 25.5-inch scale length. It’s just a few inches shy of being considered a full-size acoustic guitar, but its sound profile definitely makes it seem like a full-sized model. 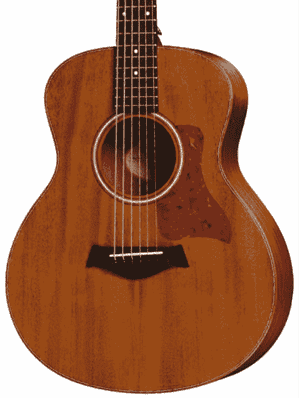 The Big Baby Taylor features a solid Sitka spruce top and layered sapele back and sides. The solid spruce top helps in articulating notes clearly, while the layered sapele makes the guitar less vulnerable to the effects of fluctuating temperature and humidity levels. The tonewood combination gives the guitar a rich and well-balanced sound. The solid wood top also means the sound quality of the Big Baby will get even better the more the guitar is played. This guitar also has a solid sapele neck topped with an ebony fingerboard, a Nubone nut, an African ebony bridge, a Micarta saddle and die-cast chrome tuners. The Taylor Big Baby is easy to play and learn on, stays in tune well and has excellent intonation across the fretboard. This is really a great guitar for kids because it’s lighter and more comfortable to play. This is one acoustic guitar that’s terribly hard to put down! The Martin LX1 is a small wonder of a guitar. This acoustic model belongs to the Little Martin lineup, Martin’s smallest guitars. The Martin LX1 boasts a solid top of Sitka spruce. The back and sides of the guitar are made from mahogany high-pressure laminate. The body is done in 3/4 scale, making it easy and comfortable for young guitar players to form chords across the fretboard. The neck, by the way, is made of rust-colored Stratabond, a sustainable material that makes the neck more rigid and less prone to moving or warping. The result is a stable action and consistent intonation, even with fluctuations in humidity and temperature. The neck is topped with either a solid morado or East Indian rosewood fingerboard. The Modified Low Oval neck shape adds to the guitar’s easy playability, so kids won’t have a hard time practicing their chords and scales. The build alone makes it a great choice for kids and other small-handed players. However, the Martin LX1 doesn’t only win in size and materials but also in terms of sound. This Little Martin produces a unique sound with impressive range. It’s actually louder than its diminutive size would suggest. Another great acoustic guitar for kids is the Yamaha APXT2 3/4 Thinline model, an acoustic-electric guitar with a cutaway. When you blow this up to a full size, you’ll be left with the APX500III, Yamaha’s best-selling electronics-equipped acoustic guitar. This 3/4 size version of the popular model has all the features that make its bigger sibling great. It features the System 68 (contact pickup) preamp with volume and tone controls. This system is based on the ART (Acoustic Resonance Transducer) system on the APX500III. The APXT2 also comes with a Yamaha-exclusive chromatic tuner. The transducer system on the Yamaha APXT2 effectively delivers a natural acoustic tone when the guitar is plugged in. It is able to dampen any excessive and undesirable vibrations from the top of the guitar while picking up and retaining small resonances, resulting in excellent dynamic balance. The Yamaha APXT2 3/4 acoustic guitar sports a spruce top and meranti sides and back. On the Old Violin Sunburst variant, the neck is made of nato. The guitar also has a rosewood fingerboard and bridge. The thinline body combines superior playing comfort with a sound that’s impressive for such a beginner- and budget-friendly guitar. 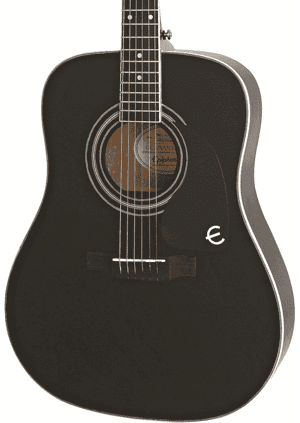 The Epiphone Pro-1 Plus is an acoustic guitar that’s designed with young beginner players in mind. It has a compact size as well as a solid spruce top that makes the guitar sound better the more it is played – a great motivating tool for beginners! The Pro-1 Plus acoustic by Epiphone also features the proprietary JumboPro frets, which give new guitar players an easier time fretting notes and chords. This is paired with another beginner-friendly feature: the Pro-Ease fingerboard and string coating, which gives the guitar a smooth, fast action and reduces string buzz. And because the body has a shorter scale, there is less tension on the neck, so players won’t have to press down too hard on the strings to properly form a chord. Other features that make the Epiphone Pro-1 Plus a great guitar for kids include the neck’s easy-to-play EZ-Profile C shape and the Ultra Light Strings, which are great for young fingers and make playing the guitar a pain-free affair. Another thing we love about the Epiphone Pro-1 is that it includes a helpful booklet about playing the guitar. Every purchase of the Pro-1 also comes with free eMedia online lessons. 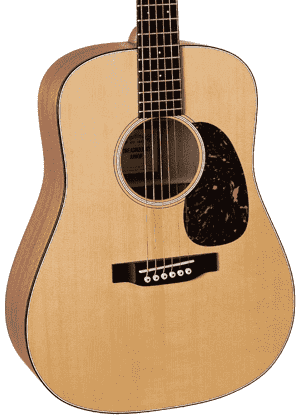 The Martin LXM Little Martin shares a lot of similarities with the LX1 we’ve listed above. One of the key differences between the two models is the top. The LXM comes with a spruce pattern high-pressure laminate instead of the solid wood on the LX1. Because laminate is used for the entire body, the LXM has a lower price point than the LX1. Now, you may be thinking you’re getting an inferior instrument with the LXM, but this is not the case at all. In fact, you can hardly notice any significant different in terms of sound – the LXM delivers the same Little Martin tone, characterized by good bass notes and bright tones. The LXM is also more climate-resilient because of the laminate materials used in it. Laminate or layered wood increases the LXM Little Martin’s ability to withstand fluctuations in humidity and temperature levels, making it a great option for kids traveling with their guitar to lessons, camp, grandma’s, or just about anywhere. The LXM also has Gotoh nickel tuning machines instead of the chrome on the LX1. Does it make a difference with keeping the guitar in tune? None whatsoever – both models keep their tune really well. How about this little dreadnought as an acoustic guitar for kids? The Martin Dreadnought Junior is a bit bigger than the Little Martin line and features a solid wood construction, producing a rich, resonant sound with a full tonal range. For its size it has an impressive projection and bass output. This fun little guitar expresses the trademark Martin voice in a smaller package. The Dreadnought Junior has a solid Sitka spruce top with scalloped X-bracing, solid sapele back and sides, select hardwood neck, a Richlite fingerboard with small dot inlays, a Richlite bridge with a Tusq saddle and hand-rubbed satin finish. The Richlite used in Martin guitars has received certification from the Forest Stewardship Council, or FSC. What’s great about Richlite is it is a great eco-friendly alternative to ebony and in terms of acoustic performance, it sounds just as good as natural ebony wood, if not better! 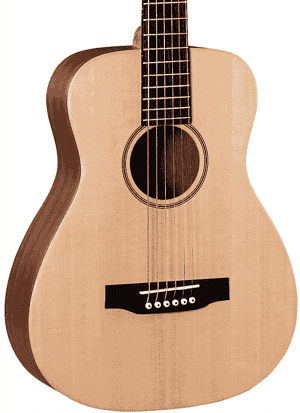 The 24-inch scale makes the Martin Dreadnought Junior easy for kids to play, though it may be more suited for older kids because of the 1.75-inch nut width. By comparison, the LX1 Little Martin has a smaller nut width of 1.6875 inches. Overall, playing the guitar is a fun and rewarding experience, and getting children started on their musical journey is easy with the guitars we’ve listed here. Why choose an acoustic guitar for children? Is an acoustic guitar a good choice for a first instrument for kids? Absolutely. It’s a versatile instrument that can accommodate a number of musical genres and playing styles, and it’s also an excellent accompaniment to the human voice. What makes these acoustic guitars great for kids? Because children have a smaller stature and shorter arms than grownups, size is an important factor to consider when choosing the best acoustic guitar for kids. This is why all the guitars we have chosen to be included in this list are smaller than full-size guitars. And because they are smaller, they also weigh less. The smaller body size and lighter weight of these acoustic guitar models make them easier to hold so that kids won’t have to exert too much effort on trying to keep the guitar in place or reaching the first few frets. They can focus on their playing instead of physically struggling to hold the guitar. These guitars also have necks that are specially designed for fast and easy playing by small hands. Because the guitars on this list have a kid-friendly size, they are comfortable to play. You will find that most of the guitars on this list are marketed as travel guitars because of their portability. While it’s true that these models (with the exception of the Epiphone Pro-1) weren’t initially designed for children, they are certainly a good fit for young players because of their smaller size. It’s wonderful to see young faces light up when they are given a guitar that seems to be made just for them. These acoustic guitar models are also built to last for many, many years. They would be a reliable companion for young musicians all throughout their guitar playing career. Why is it important to get a quality guitar for kids? The moment your child shows genuine interest in learning to play the guitar, it’s recommended to invest in a good instrument from the get-go. A too-cheap guitar that’s made with poor-quality materials comes with a lot of issues, such as an uncomfortable string action, intonation issues, fret buzz and a tinny sound, among a host of other problems. This can make the playing experience very disheartening for kids, and it could make them lose interest in music altogether. And even if your child realizes he or she doesn’t really like playing guitar, you can take it up yourself. You can also choose to sell the guitar for nearly the same price new, because quality guitars don’t lose their value that much. You want your child to have a fun and productive learning experience, so getting a great acoustic guitar for kids right from the start makes all the difference. If they think a guitar sounds really nice, they would be more inspired and motivated to play.